A team of chemists at Hokkaido University in Japan has developed a motor made out of crystals that can repetitively bend and unbend when light is shone on it. 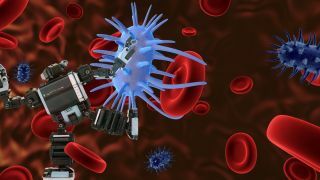 It's a major step towards so-called 'molecular robots', which could eventually swim through the bloodstream to deliver drugs to specific places within the human body, or target a particular kind of virus or disease. To do that, though, the robots need some way to convert motion at the molecular level into propulsion. The motion has to also be repeatable and controllable. Those are tough requirements but the researchers, led by Yoshiyuki Kageyama and Sadamu Takeda, believe they have found an answer. The motor they created, which they describe as "a crystalline assembly of azobenzene derivative and oleate", is made of ingredients commonly found in dye manufacturing and cooking oil. Part of those ingredients come in two forms with different shapes, and and can be persuaded to switch between them when exposed to blue light of a particular wavelength. As such, it can be formed into a motor capable of capable of flexing autonomously when light is shone on it, with the speed of the bend-and-unbend process depending on the intensity of the light. Some of the crystals they created were even able to exhibit "swimming-like" motions in water. "The ability to self-organize rhythmic motions, such as the repetitive flipping motion we observed, is one of the fundamental characteristics of living organisms", said Kageyama. "This mechanism can be used in the future to develop bio-inspired molecular motors and robots that will find applications in wide areas, including medicine".